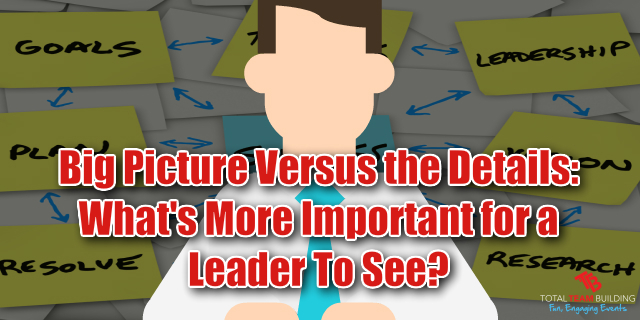 Big Picture Versus the Details: What’s More Important for a Leader To See? A lot of top leaders and executives always seem to have a lot of big plans to talk about and visions to share about the company, but how often do we see them laying out a step by step plan about how those visions will come about? Is it better to be able to create grand visions of what success looks like or to be able to map your way to success from where you are now? There are two general types of thinkers in the world: those that think about the large themes and systems of life and those who focus on the smaller details about how everything works together. Which one is a better fit for a successful business leader? To find the answer to this question we first have to understand more about the types of thinking. What does it mean to be a detailed thinker? Some people use the forest and trees analogy. Detailed thinkers look at a collection of trees and see the individual trees themselves. What type they are, how close together they are, etc. Some people, possibly even you, can focus on the smaller details more easily than on large themes and vague ideas. Most detail thinkers like facts, figures, and concrete answers to problems. They don’t think about where the end result will take them, but think more about what steps need to be taken immediately and how exactly they should be done. What is a Big Picture Thinker? Thinking big picture is the opposite of thinking about the details. You are looking at a collection of trees and seeing a forest rather than seeing the individual parts of that forest. How large is the forest, are there other forests nearby, who is looking for a forest to buy, etc. Essentially, big picture thinkers can grasp concepts more easily without having solid information about what to do next. This thinking style leads you to develop goals and visions, whether you can exactly map out how to reach them or not. You will more than likely have an idea about how things should be done, but you might not be able to list to minute details that would need to happen for you plan to come to fruition. Which of These Thinking Styles is More Compatible with Business Leadership? There’s no easy answer to this question. Most people would consider it more useful to be a big picture thinker in business, as you will be able to observe outside trends, give your company a vision and mission, and contribute towards making the company meet those goals. Many CEOs are most likely big picture thinkers, as this is a good way to be when you have an entire company under your leadership. It’s important to know what’s involved in reaching those goals, but it can also be important to see how you and your employees should be proceeding and what smaller steps should be happening. Detail thinking tends to be more vital for lower management and leadership positions within the company. While a top official may have more circumstances where he’s required to find and maintain a vision for the company, anyone under him (that includes the CFOs and COOs) needs to be able to plan out exactly how that vision will be reached. The good news is that if you think a certain way you are not stuck thinking that way forever. There are certain ways to practice being more detail-oriented or seeing the big picture. In fact, it’s highly recommended that you attempt to see things from a different point of view, as this will help you to become more knowledgeable and to understand the work that needs to be done more easily. However, even if you can learn to think in the opposite way as you normally would, you will most likely never be natural at it. This means that it’s essential for you to hire someone to fill that particular skills gap if you are in a position of significant leadership. A big picture thinker and a detail-oriented thinker can complement each other famously and bring about a greater overall plan, vision, and understanding within the company. Thinking is something that can be difficult to control. If you know which type of thinker you are already, see if you can polish up your skills in thinking the other way as well. If you don’t know, take a simple online test to figure it out for yourself! No matter which type of thinker you are, learn to play to your strengths and use that thought process for the best in your leadership. Total Team Building specialise in teams…we facilitate fun engaging experiential team building activities designed to enhance team culture, leadership, communication and collaboration. For more information about how Total Team Building can help you and your team contact us today. https://www.totalteambuilding.com.au/wp-content/uploads/2018/04/Big-Picture-vs-Detail.jpg 320 640 Darren Brady https://www.totalteambuilding.com.au/wp-content/uploads/2016/01/ttb-logo-new.png Darren Brady2018-04-18 10:00:522018-04-14 02:14:45Big Picture Versus the Details: What's More Important for a Leader To See? Teamwork is a difficult thing to manage in today’s workforce. Employees, especially millennials newly entering the workforce, are looking for satisfying jobs where they will be able to have their say and see where their efforts are bearing fruit. While this isn’t a bad quality, it can be challenging when working with teams, as there will always be differences in opinions about how things should be. Is it okay to have conflict among team members? If it is, what does good conflict actually look like in the workplace? These are the issues I’m going to be addressing in this article. 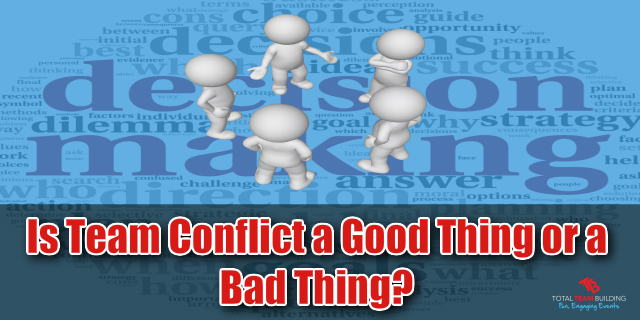 Is Conflict a Good Thing or a Bad Thing? Conflict, when done in the right way, can be the best and most productive thing for your team. Positive conflict happens when ideas are discussed in a way that does not discourage people from speaking or debating. Only when you have established a culture of trust can employees discuss anything to do with the project without fear of being abused or shut out for an idea that may not make much sense. Additionally, employees need to be able to resolve any issues they have with each other at work. This can only happen through positive conflict situations, where employees feel okay about confronting each other in regards to certain situations at work. Although positive conflict may still feel uncomfortable, positive conflict actually resolves the issue and allows teams to move on to something more productive. It results in a happier and healthier workplace where things don’t fester over time in people’s minds, and instead are brought into the open and dealt with quickly. Is the conflict solving an issue? A conflict that isn’t based on a real issue can be unproductive and harmful to your team. Make sure healthy conflict surrounds real issues that will make a difference to the team in one way or another. The goal should be based on producing the best possible solution in the shortest amount of time. Are people respecting each other? If your employees are not acting respectfully towards each other, then you as the leader need to step in and control the situation. There should be a respectful discussion going on that allows everyone to speak their mind without fear of reproach or bullying. Creating a culture of trust helps with this. Are new ideas being presented and debated? Sometimes conflict involves the same issues being presented over and over again. This is not a healthy way to debate, because nothing new is getting solved or changed by the discussion. Instead, once something is solved and debated it should be put to the side so that new issues can be discussed instead. How competitive are employees with each other? Top performers tend to be more competitive towards each other than the average worker. To help control this and turn it into something good, let the employees compete with each other in certain areas, as long as they are working towards a team goal and making progress. Is there a set of rules being followed for the discussion? Healthy conflict should follow a set of rules of engagement that will guide employees on how to treat each other during a discussion. Having this set of rules will make everything go more smoothly and help employees to know how they should or shouldn’t approach a discussion. Simply put no interpersonal politics and personal attacks. Conflict should be limited to the ideas and concepts with the ultimate goal of producing the best possible solution for the team. Do employees agree at the end of the conflict? While your employees may never see eye-to-eye exactly, they should be able to come to a resolution and make a decision at the end of the conflict session. As the team leader, you can help to promote healthy conflict within your team. Creating the right company culture that focuses on trust, adaptability, flexible mindsets, openness, and acceptance of new ideas will help your employees embrace positive conflict. Remember that conflict will never be particularly pleasant for anyone, because it does involve two or more people with differing opinions, but if it’s done in the right way it can engage the team in a positive way. Conflict doesn’t have a good reputation in the business world, but it’s something that shouldn’t be avoided. Instead, usher in positive conflict and great discussions with your employees to help create productivity and useful changes in your workplace.